Just Romantic Suspense: Hi, I’m C.A. Szarek and I’m addicted to Series. Hi, I’m C.A. Szarek and I’m addicted to Series. Congratulations to "Bn100" and "Kai", the winners in C.A. 's giveaway. Thank you to all who participate. I’m addicted to writing series. I can’t help myself; I am currently writing three separate ones that are vastly different from each other. When characters introduce themselves to me (they don’t like when I say I made them up) they usually bring a friend or two. These secondary characters are usually made of awesome in one way or another, and demand a story of their own (some are more patient than others). That right there is why I get sucked into series—writing and reading them, actually. Whether it’s a made up fantasy world or a contemporary setting, interesting characters draw you in—if I did my job right as an author. So the secondary characters leave you wanting more. Onto the next book, I say. 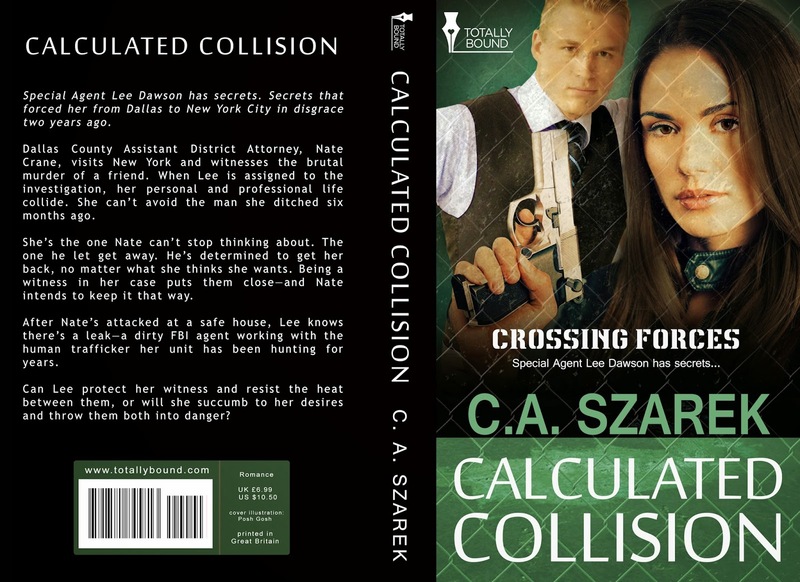 Lee, the heroine of CalculatedCollision (Crossing Forces Book Three) that just released June 6, 2014 from Totally Bound Publishing, is one of those eye-catching characters that demanded her own story from the start. We met her in book one, Collision Force, as a helpful FBI agent toward the end of the book. Then, in book two, Chance Collision, she demanded more of my attention when she was paired with the hero, Pete. No, she wasn’t his heroine, but she definitely reminded me she needed her own story. I complied, because they rarely give me peace if I don’t. I adore Lee, and her man, Nate. It was a tough story because of her past, and the baggage she’s carried around for a few years. I cried when I was writing a few scenes, so I hope the reader feels that emotion when it’s read. A few more lovely characters popped up in Calculated Collision, as well, so I guess as I continue on, I’ll see who else might want to be heard. Book Four, Collision Control comes out October 3, 2014 and I met a few interesting characters along the way with it as well. I’m sure in book five, which I am about to start writing, even more will say hello! I’m not worried about them letting me know, they always do! Do you like to read series? Why? What’s your favorite part of connected stories? What don’t you like about them? Collision (Crossing Forces Book Two) OR Calculated Collision (Crossing Forces Book Three)! Please make sure you leave your email with your comment! Hard-as nails-FBI agent collides with an attorney and former lover when she has to take him into protective custody after witnessing a murder at the hands of a human trafficker. Special Agent Lee Dawson has secrets. Secrets that forced her from Dallas to New York City in disgrace two years ago. Dallas County Assistant District Attorney, Nate Crane, visits New York and witnesses the brutal murder of a friend. When Lee is assigned to the investigation, her personal and professional life collides. She can’t avoid the man she ditched six months ago. She’s the one Nate can’t stop thinking about. The one he let get away. He’s determined to get her back, no matter what she thinks she wants. Being a witness in her case puts them close—and Nate intends to keep it that way. After Nate’s attacked at a safe house, Lee knows there’s a leak – a dirty FBI agent working with the human trafficker her unit has been hunting for years. Can Lee protect her witness and resist the heat between them or will she succumb to her desires and throw them both into danger? Sweat broke out on her brow and Lee gripped her Glock tighter instead of wiping the moisture away. She bit back a curse. She hated being in the back. Being back-up. Lee and her partner, Clint Downs, were the lead agents of their unit, and usually headed raids. Their boss, Special Agent Olivia Barnes, wanted them—Lee in particular—to take a breather from going hard and fast. Nothing wrong with the passenger seat, right? Maybe if she kept telling herself that, it’d sink in. Hard and fast was all Lee knew. How she got the job done. But even her partner had reminded her there were twelve members of their human trafficking unit. They were all partners. Ugh. She’d rather hang a ‘Doesn’t play well with others’ sign around her neck. Her partner’s gravelly voice made Lee tense. “Yup.” She didn’t look his way. Downs didn’t have a chance to answer. The battering ram exploded the door in front of them and wood splinters went flying. Collective shouts of “Federal agents!” coupled with “FBI!” surrounded her and she rushed forward behind her teammates. In correct formation, head in the game. Giveaway ends 11:59pm EST July 6th. Please supply your email in the post. You may use spaces or full text for security. (ex. jsmith at gmail dot com) If you do not wish to supply your email, or have trouble posting, please email maureen@justromanticsuspense.com with a subject title of JRS GIVEAWAY to be entered in the current giveaway. US postal addresses only. Is there a support group for us? I love series, primarily because I hate to leave beloved characters. I want to know what happens to them beyond their initial story. And, if the community was constructed well, I want to revisit the town and see favorite secondary characters developed. I acknowledge my addiction and own it. Hahaha! Thank you for the comment! I don't know that I'd want to "fix" my addiction! You nailed it Colleen!!! The secondary characters make the story in a lot of ways! Thank you for the comment!! I like series and my favorite part is seeing previous characters in the stories and what is happening to them. My least favorite part is if I miss a book and then I don't understand everything that is happening. I ADORE that, too, Maureen. It's like a "check-in" so we can see a slice of the HEA in action. That's my fave part! In mine I always make sure they get a mention, if they're not on page! (I have demanding characters, so they usually won't have it any other way!) Thanx for the comment! Congrats CA on the series!!! Sounds fabulous :) I'm a glutton for a good series. Mainly cuz I can glom characters and worlds that I've fallen in "book" love with :) I love when supporting characters get their time in the spotlight. It's what fuels the addiction. Thank you, Erin! I adore this series. Book 4 will be out 10/3! I always fall in love with them! Each Hero grabs me in a different way! ;) Most of the time my secondaries stand up and wave "Hey, I need a book." so they usually get their way, too! ;) Thanx for the comment! Thank you Brooke! I love series for that reason, too! Characters that grab you so you don't have a choice BUT to be invested! :D Thanx for the comment! I love series because the main characters in the series are like old friends that I would keep in touch with. Of course, the story would have enough information that it is a stand alone and yet at the same time, the story has some background that would make readers be interested to go and read for more information. I agree, Kai! If I did my job as an author that's all there! In love checking in the heroes and heroines of books past! Thanks for the comment! I do love series. I enjoy revisiting a town and characters that held my interest I prior books. Series can have related characters without being dependent on reading from the book one. What I don't like, well a series that continually introduces new characters and doesn't weave in the existing ones. Part of reading a series is to read more about characters we were introduced to in earlier books. Or when an author turns a good character who would make a great lead into a jerk. There are ways to include both and keep the books fresh. Well said, Suzi! I love strong secondary characters, writing and reading them. I love series that are stand alone but have reoccurring characters! Looking a slices of HEAs is so much fun! Thank you Brenda! I really hope you enjoy my series and I agree wit pretty much everything you said, lol!!! Thanx for the comment!